There’s a scene in the second chapter of Marvelman in Warrior Magazine by Alan Moore and Garry Leach which sung out and made me love the comic forever. The first of what would be known as deconstructed superhero stories, with the likes of Watchmen, Dark Knight, Zenith, Animal Man, The One, Brat Pack and more. But it was one that both had its Marvel-cake and ate it, glorying in the simple four color stories designed for children while also subjecting it to the postmodern snark of adult critique. And seeing how the two clashed. I mentioned it here, when talking about Tom King‘s work with Kite-Man over in the Batman series. Well, Birth Movies Deaths got Neil Gaiman to talk about Alan Moore, Captain Marvel, Marvelman , Miracleman- and his role in that, both as a reader and as a writer. 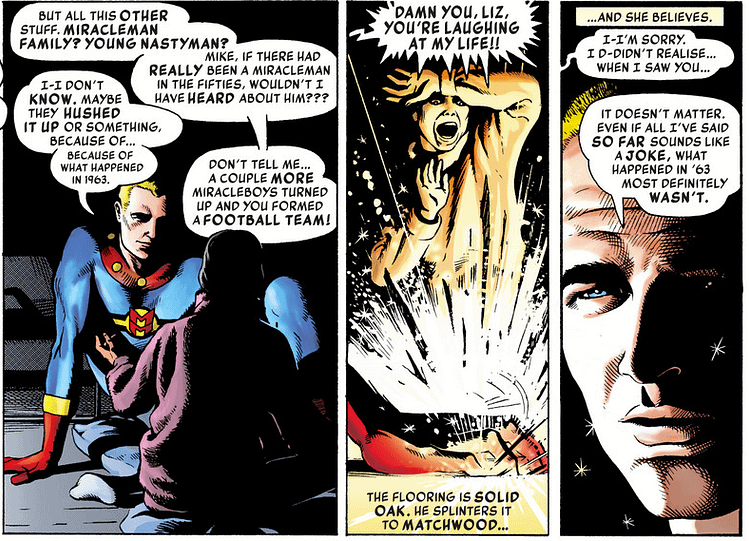 Gaiman suggested that the future of Miracleman stories is still in Marvel Comics’ court… and it turns out that those panels above were his moment of revelation. The panel that changed a medium?